Major companies across the economy support the Paris Agreement and the decisions made at COP 24 in Katowice, Poland, to implement it. After the Paris ‘rulebook’ was drafted in December 2018, 17 companies signed a C2ES statement welcoming the decisions reached and urging governments to quickly conclude remaining issues on the use of market mechanisms. These companies are committed to working on their own and in partnership with governments to mobilize the technology, investment and innovation needed to transition to a sustainable carbon-neutral economy. 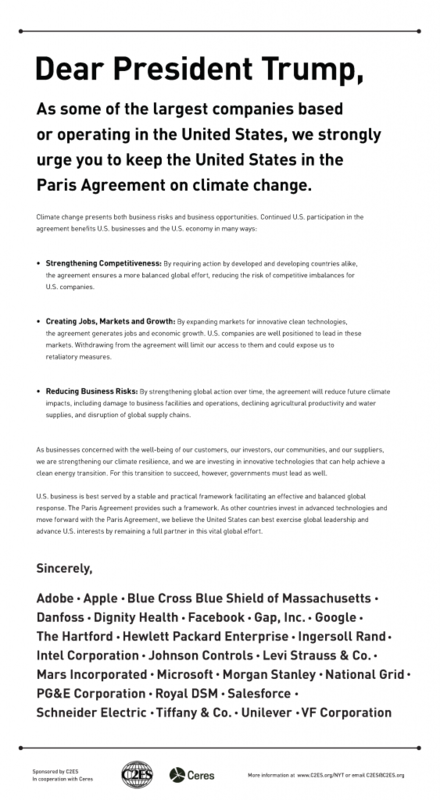 The rulebook statement was the latest achievement in our ongoing effort to build business support for climate action. In full-page advertisements in The New York Times, The Wall Street Journal, and New York Post in May and June, companies told the president continued U.S. participation in the agreement will help them manage rising climate risks and compete in growing global clean energy markets. The ads were sponsored by C2ES in cooperation with the sustainability nonprofit Ceres. The full text of the ad is below, and appeared May 9, 2017 in the the New York Post, May 8, 9, 16, 18, and June 1 in The New York Times, and May 9, 17, and June 1 in The Wall Street Journal. As momentum built toward a global climate agreement in 2015, 14 companies signed a C2ES letter in support of the core principles — long-term direction, transparency, competitiveness, and carbon pricing — that would form the basis of the Paris Agreement. 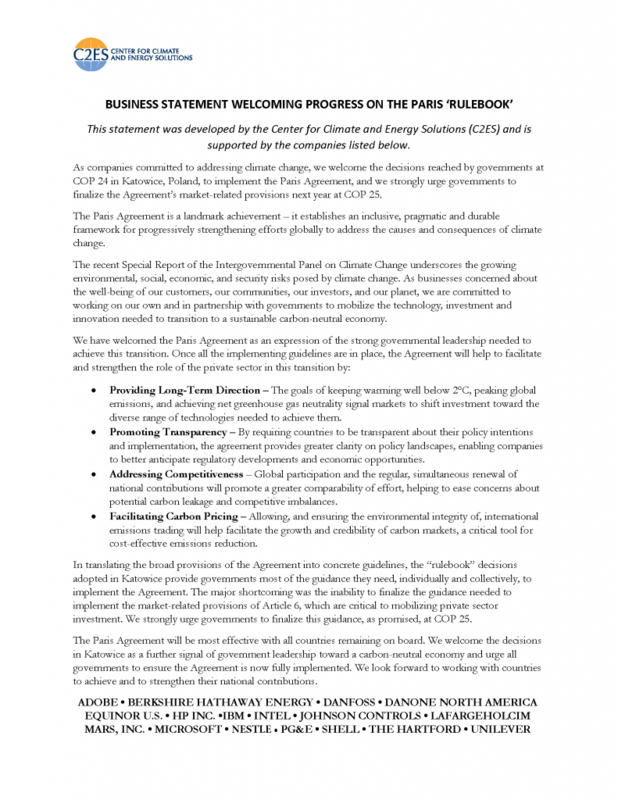 In 2016, shortly after its adoption, 12 companies signed a C2ES statement welcoming the Paris Agreement as a landmark achievement — establishing an inclusive, pragmatic and, hopefully, durable framework for progressively strengthening efforts globally to address the causes and consequences of climate change.